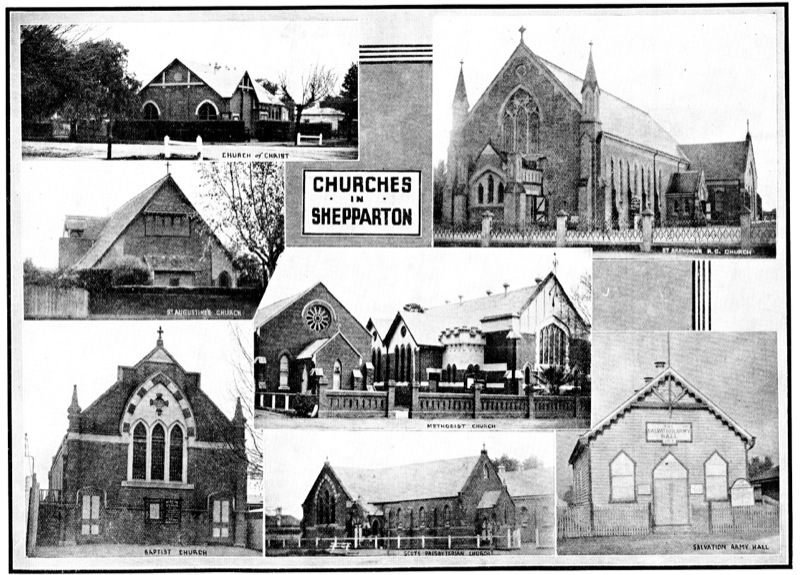 THE first religious service in Shepparton was the United Free Methodist, and was held at the rear of a blacksmith's shop in a cottage owned by Mr. John Furphy in Wyndham Street, in the year 1873. The site is marked with a tablet in front of Moran and Cato's shop. This tablet was erected by Mr. William Furphy in 1934, when a new frontage was being erected, as a memorial to the historical event over 60 years past. 'The church was pioneered from Toolamba, which was an .outpost of the Rushworth church. The Rev. L. G. Reid was the first minister to conduct service in Shepparton, and for that matter the first to preach in the first building erected for church service, when he preached' at. the official opening. The United Free Methodists erected the first church in the town in Welsford Street in 18741.